The period since our previous Newsletter in December 2017, has been an exciting and productive one for the World Plumbing Council (WPC). 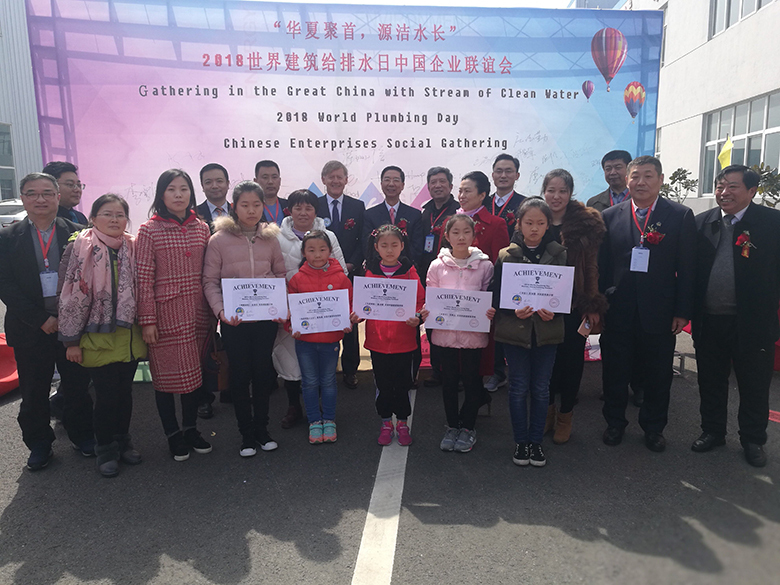 One of the key ways the WPC promotes its role is through World Plumbing Day and this year, on or around 11 March, the celebration of plumbing was bigger than ever. Community meetings, industry seminars and forums, trade, product and skills displays, exhibitions and, competitions were held all over the world, all concentrated on celebrating plumbing and its contribution to society. A full wrap of all the wonderful activities, events and highlights that took place around the world on World Plumbing Day 2018 is contained inside this edition of the WPC Newsletter. Some particular highlights were the inaugural events held in Huai'an, China, Cebu in the Philippines and Lagos, Nigeria. The event in China provided a focal point for industry leaders and representatives to socialise and interact, and to hear presentations from their industry colleagues about latest industry developments. 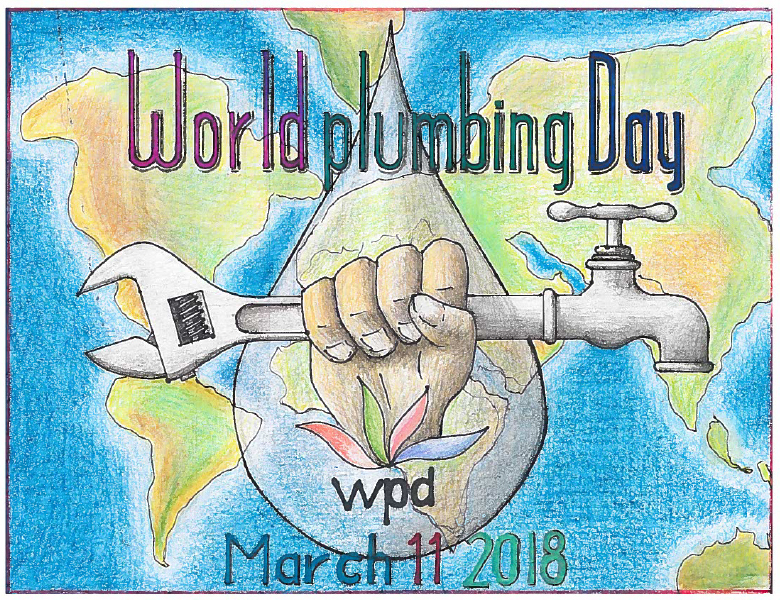 A children's' poster competition attracted over 1000 entries, reflecting the high level of engagement with the purpose of World Plumbing Day. The WPC wishes to thank the Plumbing Facilities Committee (PFC) of the China Construction Metal Structures Association, PFC Chairman Liu Jian and major sponsor, HuaXia Yuanjie for helping make World Plumbing Day in China such a success. Furthermore I would like to thank all our dedicated WPC members for making this World Plumbing Day the best so far and I look forward to the 10th annual World Plumbing Day in 2019. Alongside all the preparations for World Plumbing Day, the Executive Board of the WPC met via teleconference in February, where WPC Directors updated the Board about progress and initiatives within their portfolio responsibilities. It is pleasing to report that from Finance and Governance, to Education and Training and Research and Innovation, there has been a great deal of activity as the WPC pursues its vision. WPC GENERAL MEETING AND FOUR PILLARS OF PLUMBING (PRODUCTS) FORUM, 17 MAY, ONTARIO, CALIFORNIA – REGISTER NOW! The WPC will hold its next General Meeting followed by the Four Pillars of Plumbing (Products) Thursday, 17 May 2018 at the DoubleTree by Hilton Hotel in Ontario, California. All WPC Members and supporters are welcome to join and contribute to both events which are free of charge. Please register your attendance here. The WPC has arranged a group booking rate at the DoubleTree Hilton Hotel for the 16th and 17th of May. Please contact the secretariat for the booking link if you are planning to attend. To take advantage of the preferential rate, bookings must be made by 24 April. This WPC event is being held following the Emerging Water and Technology Symposium (EWTS) which is being co-convened by several of our member organisations, notably the American Society of Plumbing Engineers, IAPMO and Plumbing Manufacturers International. EWTS will be held 15 – 16 May and presentations will cover a wide range of contemporary plumbing industry topics. There is still time to register for EWTS, follow this link for further information. Around the world people came together to celebrate World Plumbing Day. Below is a recap of the activities, events and highlights that took place. At the Plumbing Industry Climate Action Centre (PICAC) in Melbourne, 300 attendees took part in the WPD event. An Industry Forum focused on the theme "Participation, Practices, Products and Protection: The four pillars of plumbing" took place with several industry participants speaking including WPC Chair, Shayne La Combre. A livestream of the industry forum is available on the PICAC Facebook page. An Apprentice Skills Contest was also held with plumbing and sprinkler fitting apprentices competing for prizes and the opportunity to be selected to participate in the United Association Apprentice Skills Contest in Ann Arbor, Michigan. 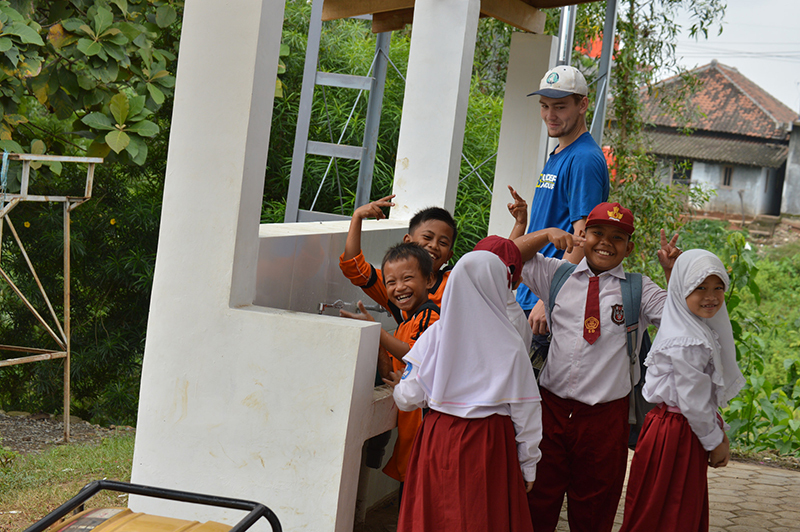 A Trade Expo was held with companies from all areas of the industry participating and Community Plumbing Challenge 2017 participant Aidan Ward held a workshop with high-school students explaining all the work undertaken in Indonesia. Several of WPC's member organisations, most notably IAPMO, ran their own WPD Poster Competition's for schoolchildren in 2018. The quality of artwork was extremely high and the exercise was an excellent way of promoting the role of plumbing. Pictured above is the poster from IAPMO contest first place winner, Chantel Saad, from Floyd M. Stork Elementary, Alta Loma, CA who won for the 2nd year in a row. Other posters from events around the world are pictured below. The international team assembled for the final installment of the Community Plumbing Challenge project in Indonesia (CPC2017). Over one week, the team completed the renovation of the pre-existing toilet facilities plus the addition of a hand-washing area for the second school building. The work started off with the cutting of two doors into walls of the new toilets, bricking up piers for the roof, digging internal drainage for WC's, forming and pouring concrete floors in the WC's, forming and pouring the hand basin and bricking up the partition walls and rendering. The American Society of Plumbing Engineers, the Alliance for Water Efficiency, the International Association of Plumbing and Mechanical Officials and Plumbing Manufacturers International, in cooperation with the World Plumbing Council, will convene the sixth biennial Emerging Water Technology Symposium at the Double Tree Hilton in Ontario, California, on 15-16 May 2018. On Thursday 17 May 2018 at the DoubleTree Hilton in Ontario California, the World Plumbing Council will first hold a brief General Meeting and then conduct a Four Pillars of Plumbing Forum until 5.00pm, focused on the products dimension of plumbing industry frameworks. All WPC members and supporters are welcome to attend, please register your attendance with the secretariat. Keynote presentations from Past Executive Board director Henry Hung and WPC Scholarship recipient Dr Simon Reddy. WPC Member organisation CIPHE is supporting the conference and has kindly negotiated discounts for WPC Members. Full WPC members get a 50% discount off registration fees (plus tax) and WPC Affiliate members can enjoy a 15% discount. Please contact the secretariat for discount codes. The World Plumbing Council will hold a General Meeting in Mumbai India from 1.00pm to 5.00pm on 25 October 2018. The Indian Plumbing Association, with support from the World Plumbing Council, will hold a two day Indian Plumbing Conference with a Four Pillars of Plumbing theme at the Nehru Science Centre during 26 and 27 October 2018 in Mumbai. The Mumbai conference will have four streams covering all four ‘Pillars' - Participation, Practices, Products and Protection. More than 1,000 participants and large number of exhibitors are expected. The IPA will arrange accommodation packages and a partner program. This three day conference will be based on the WPC's Four Pillars of Plumbing program. The theme will be ‘How to build a successful plumbing industry'. The next ISH, the world's leading trade fair for the combination of water and energy, will be held from 11 to 15 March 2019. ISH will begin on Monday, instead of Tuesday as in the past. The fair will be open to private visitors on the last day, Friday. Contact secretariat@worldplumbing.org to provide an event report or request listing of an upcoming event.